TRAPMASTER Professional - with the new fellow hunter management - TRAPMASTER trap alert / trap alarm / monitoring system - the ideal retrofit for most trap types. Reliable and efficient cooperation with fellow hunters is an important requirement in many areas. We would like to support you with our trap alert systems in the best possible way. 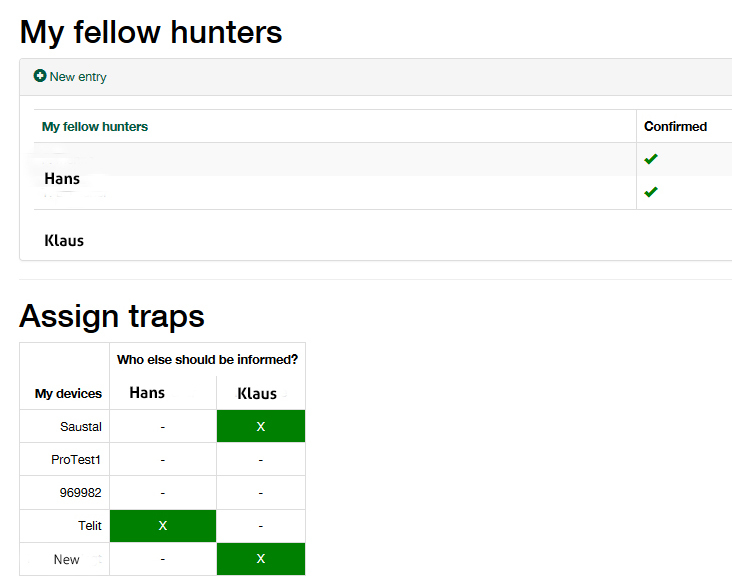 With the TRAPMASTER Professional fellow hunter notifications are easy to accomplish. Each fellow hunter also benefits from all the advantages of the TRAPMASTER online management system and receives his/her free user account including 1 EURO starting credit after accepting the invitation of the "main hunter". He/She then sees all "his/her" relevant trap alert systems (own and others) clearly in a single device list. If you are already operating your own TRAPMASTER Professional, additional "fellow hunter devices" (in which you are a fellow hunter) also appear in your device list. There they are immediately recognizable as such by the "fellow hunter symbol". All tasks and information flow seamlessly together - so you always have the full overview. The reduction to as few as possible but important messages ensures clarity and avoids "blunting". The notification channels (free instant message via app or telegram, e-mail or SMS) for catches and status messages are also available to every fellow hunter. Each fellow hunter can set up notifications individually according to his preferences. In contrast to other systems, fellow hunters are more involved and not only receive selective information. Any number of fellow hunters are possible. The main hunter is effectively relieved of administrative tasks (managing mobile phone numbers and e-mail addresses). Especially in larger areas this is a big advantage for the main hunter. In the case of your fellow hunters, the acceptance of the system increases, especially through their own device list and individually configurable message settings. The reliability of trap monitoring within the team is growing.